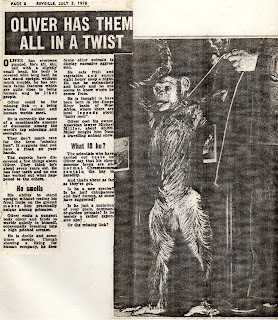 Oliver first came to widespread public attention in 1976, when newspapers and magazines worldwide became interested in the strange chimpanzee that New York attorney Michael Miller had bought off a travelling animal-act owner called Frank Burger, allegedly for $10,000. Oliver was about seven years old at that time, and had reputedly been obtained in Zaire (now the Democratic Republic of Congo). The first clue suggesting that Oliver may not be as other chimps was the reason why Burger had sold him. 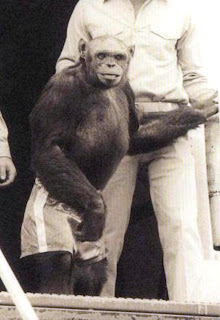 According to media accounts, Oliver had never been accepted by Burger's other chimps and could not be trained to perform with them in their stage act. Instead, he preferred to walk on his hind legs, sit cross-legged on a chair, and help Burger's wife, Janet, with the chores around the house. Oliver also made it clear that he fancied her. Not surprisingly, Janet issued her husband with an adamant proclamation concerning her pesky paramour: "I'm not putting up with this. He's going or I'm going." So Oliver went - sold by Burger to Miller. It was not only his behaviour, however, that distinguished Oliver from other chimps. Much was made in media reports of his strange morphology. Although his black fur and pinkish-brown skin were run-of-the-mill characteristics of the common chimpanzee Pan troglodytes, great emphasis was placed upon his bald, seemingly small, egg-shaped cranium (in normal chimps, this is more commonly hairier, larger, and flatter), the unexpectedly reduced prominence of his jaws (thereby yielding a somewhat humanoid appearance), his pointed (rather than rounded) ears, and even his freckles. Conflicting accounts were given regarding Oliver's body odour. Some media reports described it as very strong; yet after explorer Lieutenant Colonel John Blashford-Snell had examined him at the 1976 Explorers Club Annual Dinner in New York, he announced in his book Mysteries (1983) that Oliver had little or no body odour. Odour or no odour, the media bloodhounds pursued the scent that something was not quite right with Oliver. 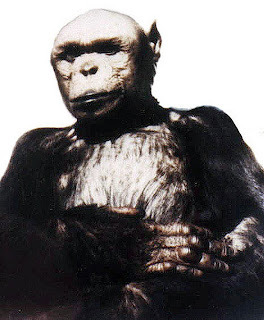 It was claimed (but never substantiated) that, when Miller took Oliver to Japan in the mid-1970s, blood tests conducted by scientists had shown that Oliver had 47 chromosomes - one more than humans, one less than chimps. Inevitably, these contentious claims (eventually fully disproved) prompted all manner of bizarre identities for Miller's egg-headed enigma. If Oliver were a Down's Syndrome chimp, as some asserted, he would have possessed an extra chromosome (i.e. 49), not one chromosome less than normal for chimps. 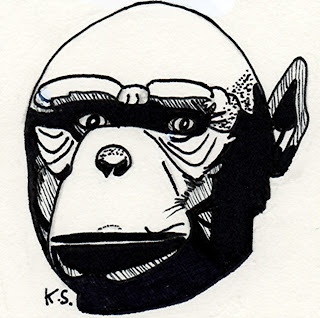 Others suggested that he might be a mutant form of chimp, or a new subspecies or even species of chimp. Scaling ever further up the ladder of improbable identities, some wondered if Oliver might be a hybrid of common chimp Pan troglodytes and bonobo (pygmy chimp) P. paniscus; a specimen of the elusive hairy man-beast of West Africa termed the séhité, or even a crossbreed of chimp and séhité; and there were even queries as to whether he was some form of mini-bigfoot or yeti! 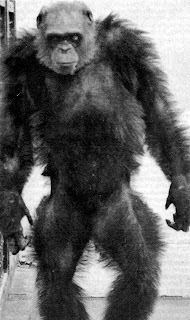 Most radical of all was media speculation as to whether Oliver could be the offspring of a chimpanzee-human mating, i.e. a veritable humanzee. In an item on African mystery primates in the Reader's Digest compendium volume Man and Beast (1993), I opined that Oliver was merely a western African chimp - but with much more dramatic options on offer, the media never paid much attention to this in their reportage. 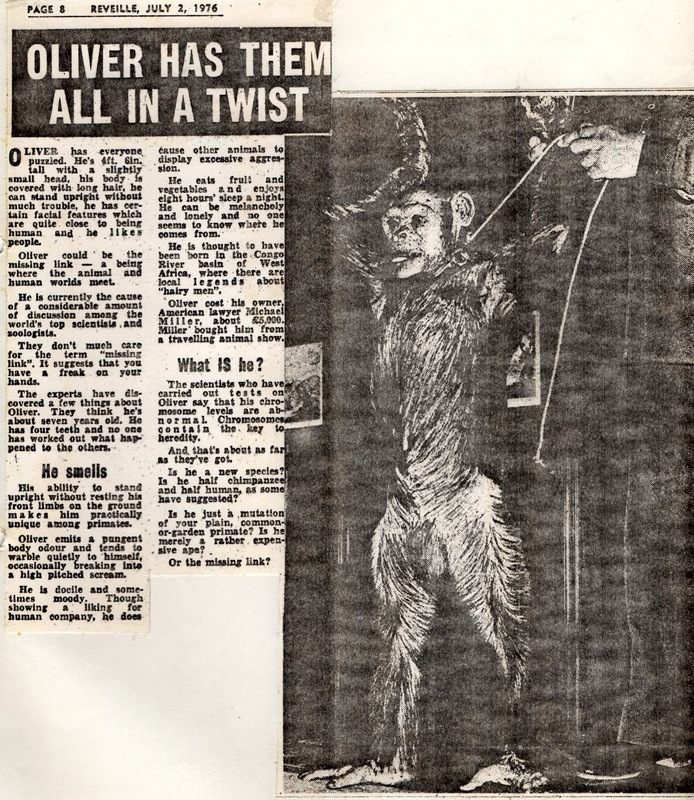 During the late 1970s and through the 1980s, Oliver vanished from the headlines, but was often exhibited as a freak or 'missing link' at various sideshows. In 1977, Michael Miller sold him to Ralph Helfer, partner in a Californian theme park called Enchanted Village. When the park closed down later that year, Helfer continued exhibiting Oliver in a new venture, Gentle Jungle, which changed locations a few times until it closed down in 1982. Oliver was transferred to the Wild Animal Training Center at Riverside, California, owned by Ken Decroo, but he was allegedly sold by Decroo in 1985. The last trainer to own Oliver was Bill Rivers. In 1989, Oliver was purchased by the Buckshire Corporation, a Pennsylvanian laboratory leasing out animals for scientific and cosmetic testing. Mercifully, he was never used in experiments, but for the next seven years his home was a 7 x 5ft cage, whose restricted size resulted in his muscles becoming atrophied so much that his limbs trembled. Happily, in 1996, Oliver's confinement came to an end, when he was retired to an animal sanctuary at Boerne in Texas's Hill County. Called Primarily Primates, it offered spacious accommodation and allowed Oliver to return to good health. He even gained a female chimpanzee companion there, named Raisin. And as to the news headlines, the sanctuary's director, Wally Swett, was determined to solve the mystery of his celebrity guest's taxonomic identity once and for all. Swett asked Chicago University geneticist Dr David Ledbetter to examine Oliver's chromosomes, which he did in autumn 1996. His studies revealed that Oliver had 48 (not 47) chromosomes, thus disproving the earlier claim and confirming that he had a normal chromosome count for a common chimpanzee. Swett, however, desired further analyses to pin-point Oliver's precise status. Accordingly, he persuaded DNA analysis expert Dr John J. Ely from Texas's Trinity University and cytogeneticist Dr Charleen Moore from Texas University's Health Science Center to conduct the most extensive genetic studies ever undertaken with Oliver. Their results were published in 1998 by the American Journal of Physical Anthropology and disclosed the following details. 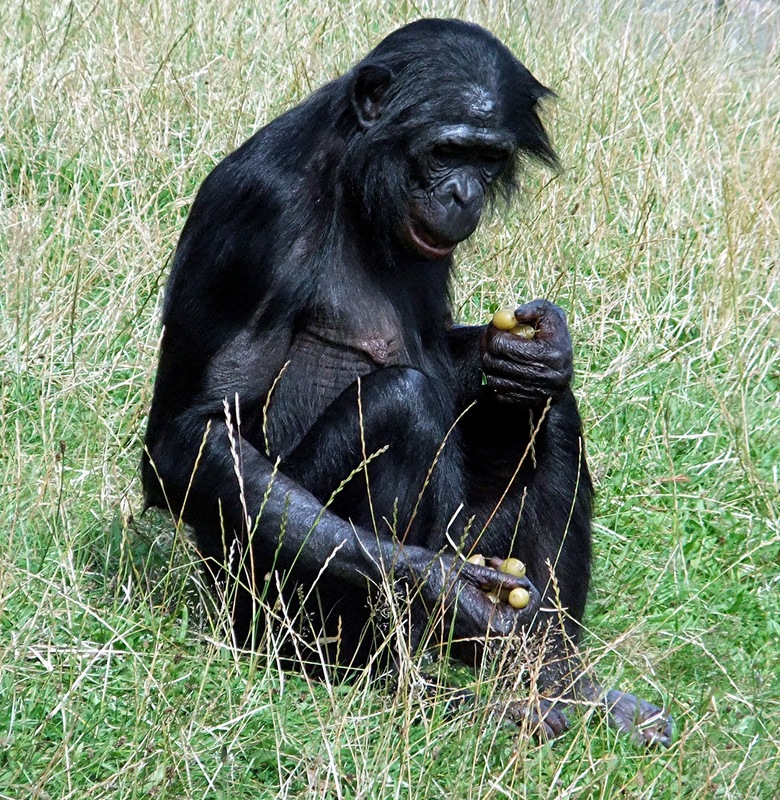 Standard chromosomal studies fully supported Ledbetter's findings that Oliver had the diploid chromosome count expected for chimpanzees (i.e. 48, in 24 pairs). They also revealed that his chromosomes possessed banding patterns typical for the common chimpanzee but different from those of humans and bonobos, thereby excluding any possibility of Oliver being a hybrid. Moreover, when they sequenced a specific portion (312 bp region) of the D-loop region of Oliver's mitochondrial DNA, they discovered that its sequence corresponded very closely indeed with that of the Central African subspecies of common chimpanzee; and the closest correspondence of all was with a chimp specimen from Gabon in Central-West Africa. This all strongly suggests that Oliver also originated from this region and is simply a common chimp - an identity entirely consistent, therefore, with my own little-publicised opinion from 1993. After decades of mystery, Oliver's identity had finally been uncovered, exposed by his genes. But what of his external idiosyncrasies? Fly and Moore's paper contained some eye-opening information dating back to the 1970s, but which was presumably not sensational enough to attract the interest of the media and thus had not previously received publicity. 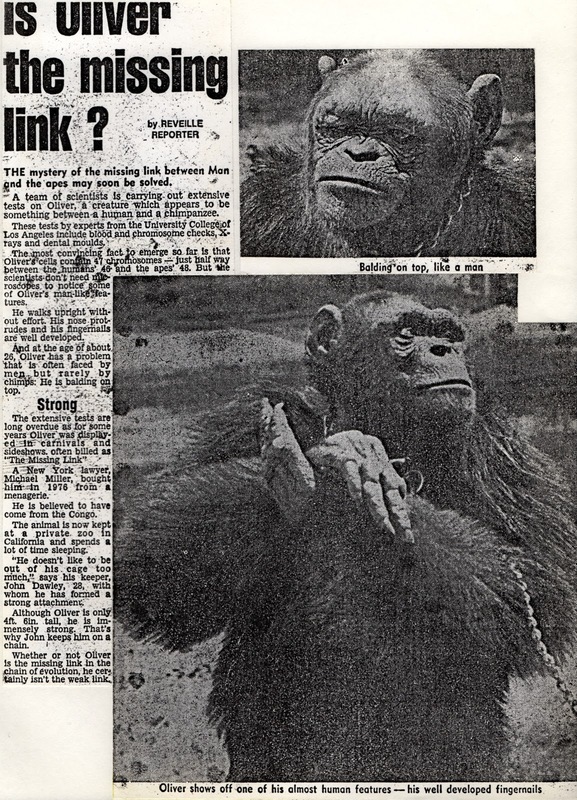 For instance, although media accounts had noted that Oliver was toothless (his teeth had been pulled), they had not revealed that primatologist Dr Clifford Jolly had examined Oliver as long ago as 1976. Jolly found that the reason why Oliver did not share the strikingly prognathous (projecting) jaw line of other chimps was due to resorption of the alveolar bone, plus a shortened maxilla and premaxilla (upper jaw bones), and underdeveloped temporal musculature. Jolly had concluded that these features were in turn caused by Oliver's toothless condition. He also concluded that Oliver's habitual bipedal gait was due to conditioning. As for Oliver's cranial morphology, ear shape, freckles and baldness, these were nothing more than individual variations, well within the range of variability exhibited by the common chimpanzee - a species that presents, in the words of primatologist Prof. W.C. Osman Hill: "a bewildering variety of individual variations". Although no longer special in taxonomic terms, Oliver was destined forever to remain a classic example of how media hype and sensationalist publicity can create with Frankensteinian fervour a veritable monster from the most mundane of animals. 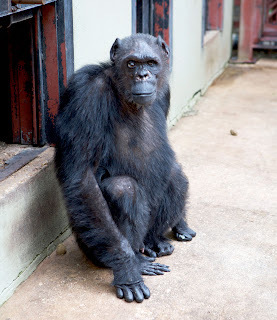 Happily, however, Oliver was able live the remainder of his days in peaceful retirement and security at Primarily Primates inside a spacious open-air enclosure with his chimp girlfriend Raisin, far away from the unwelcome media glare that had blighted this mild-mannered, highly-intelligent being's often traumatic and tumultuous life. On 2 June 2012, Oliver died of old age. He was approximately 55 years old. His body was cremated and his ashes spread over the grounds of Primarily Primates. The decision to cremate him caused some dismay among certain scientists who had hoped to conduct further tests upon his physical remains. I for one, conversely, feel that Oliver had endured more than enough speculation and scrutiny during his turbulent life, and that with the conclusive findings of Ely, Moore, and Jolly concerning his taxonomic identity on record, it was both timely and fitting that in death he should finally be granted the tranquillity, privacy, and dignity that he was never permitted in life. RIP Oliver. While I can understand the author's reluctance to have Oliver's remains studied. There are many curiosities that remain unresolved regarding his morphology. I can understand his wierd facial featuers being due to tooth removal, but simple conditioning doesn't explain his bipedal stance. Anyone who has seen videos of him can tell that he has an amazingly good posture and gait for a conditioned chimp. I'm curious. Was his foramen magnum under his skull like in hominids or was it in the rear as in other pans? What about the structure of his feet and ankles and hips? I find it hard to believe, seeing the videos and evidence, that he had the normal skeletal structure of a chimpanzee. 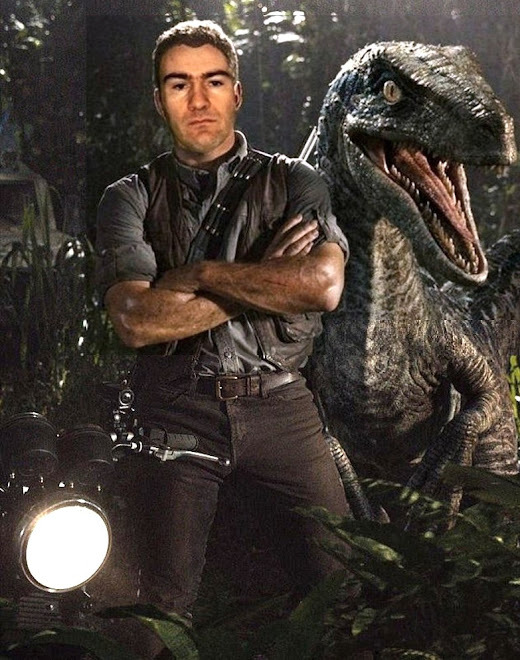 I think he was trained to walk like a human from day one by his original handler. Oliver's life ended well. Wally Swett and Vincent Pace are good people. Michael Miller deserves a lifetime leash and collar in a 5×7 cage as do all the others who tormented this ape's life. Scientific studies need boundaries. Any sentient being should be off limits for experimentation. If they look like they're suffering, they are. How do some of these people sleep at night? Of course the older and younger Oliver WERE the same creature! There is a continuous record of his whereabouts since he first hit the headlines during the mid-1970s. Also, just like humans chimps change considerably in appearance as they grow older (and Oliver had aged almost 40 years between his younger photos and his older ones). Don't worry about Truth / arnie365, he is not susceptible to things like proof or facts. He's probably a down's syndrome chimp!! As noted in my article, he couldn't have been a Down's Syndrome chimp because he was shown to possess a normal complement of chromosomes for a chimp (48), not 49 as would have been the case if he had exhibited Down's Syndrome.